Our instruction is from the Scriptures as confessed in the Lutheran Confessions, The Book of Concord. The Book of Concord was written by several Reformers, including Luther. We do not follow everything Luther wrote in the some 60 volumes of his writings so far translated into English. If so, we would follow what he wrote about the Jews, but we don’t; but when Luther wrote and preachd about the Law and Promise, we do. Our church body, The Lutheran Church-Missouri Synod got it right with their 500th anniversary slogan: “The Reformation: It’s Still About Jesus”. It surely is about His Name, His Work, His continuing mission. Asserting we have never been enslaved because we kept our noses clean is DIY, do it yourself religion and DIY religion is the prescription to all sorts of mischief and evil: for instance, Protestant indulgences. Just send your offering to my television ministry and you will be rich, that is, free from poverty and low income. You give me $100 bucks and God will give you a $1000, that is the lie of buying off God. Fake good news. He bought us. Since Lord of all sent forth His Son, like a physician to the sick in soul and spirit with wrong, for our healing, all should flock to the dear Jesus. We can’t heal ourselves of breaking God’s Law. We know the soul weighted with the “should haves, would haves, could haves, must haves” and there is no escape. Only in Jesus who bore all the shoulds, the woulds and coulds, the musts of God’s Law are fulfilled. The Pope replaces Jesus as the head of the Church. Sorry, Lord, guess you are not really at the right hand of the Father. The papacy is like an absolute monarchy. Jesus pastures, rules and governs the whole Church, yes, as our King but also the Good Shepherd, the Lamb who bore the sin of the world. If it isn’t become clear yet, it should be in these days: There is no hope in the Pope. The pope is a bad prescription for what ails us. “If the Son sets you free…” Not the pope, nor Luther. Nor spiritual fads, or human traditions and doctrines. 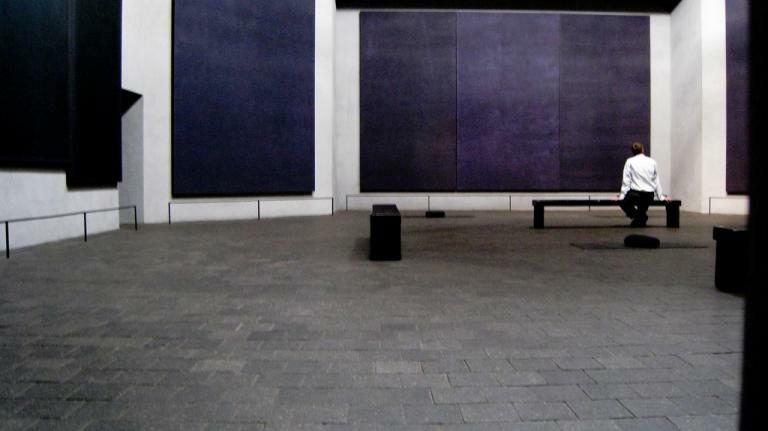 In Houston, one can visit the Rothko Chapel. Mark Rothko (1903-1970) was an abstract artist who was commissioned by Houston art collectors John and Dominique de Menil to create a “meditative space” employing his paintings. The Rothko Chapel was completed in 1971, a year after the artist committed suicide. That it is-Contemporary Spirituality. The void, emptiness, nothingness seems to permeate today’s world. And yet, there is brightness. Jesus, the Light of the World, shines through. He draws us through His Word, shows us the truth, and warms us with His love. Praise and thanks to God for His glorious love to us in Jesus! Churches are filled with light, and flowers, and candles, and stained glass reflecting the Lord who created, redeemed and sanctifies us. Today is also the Festival of St. Simon and St.Jude, two of Jesus’ apostles. Jude appears in John’s Gospel (14:22) on the night of our Lord’s betrayal and the beginning of His Passion, asking Jesus how it is that He will manifest Himself to the disciples but not to the world. The answer that Jesus gives to this question is a pertinent emphasis for this festival day: “If anyone loves Me, he will keep My word, and My Father will love him, and We will come to him and make Our home with him” (John 14:23). Abide with us fast falls the eventide. Surely both Jude and Simon exemplified, in life and death, their love for Jesus and their faith in His Word. Not only are we thus strengthened in our Christian faith and life by their example, but, above all, we are encouraged by the faithfulness of the Lord in keeping His promise to them to bring them home to Himself in heaven. There they live with Him forever, where we shall someday join them. Simon and Jude did not follow the world, nor churches in captivity to the world, looking to the darkness, the black panels of false doctrine and despair, but held captive to the Word of God, Jesus Christ and so also free, freed to follow Him and free to serve. Luther and the Reformers clearly preached the Word, not following a worldly church and worldly doctrine which does not save. Too many churches preach fake good news, the Apostles preach the real good news of Christ Jesus for sinners, by grace alone, received through faith alone, known by Scripture alone. They proclaimed the Name above all names. Next week is All Saints Sunday, and the saints did not look to the world for their light and follow the glow of their spirituality but the light shining in the face of Jesus Christ (2 Cor. 4: 6) Praise and thanks to God for His glorious love to us in Jesus!